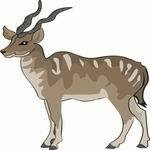 All antelope species have horns, although in some species they are only found on the males. The horns are made of a bony core, encased in a hard material made largely of keratin. They are permanently attached-not like a deer's antlers, which are shed each year. Some antelope horns, like those of the kudu Tragelaphus sp. and eland Taurotragus sp., twist in interesting spirals; others have ridges, like those of the impala ]Aephyceros melampus and the sable antelope Hippotragus niger; and others grow in wide curves with a sharp point on the end, like those of the wildebeest Connochaetes sp. (also called the gnu, a name it gets from its call, which sounds like "ge-nu"). Hooves are another specialty for many antelope. Each hoof has a split down the middle, dividing the hoof into two "toes." Because they live in wetlands and swamps, sitatungas Tragelaphus spekeii have wide hooves up to 7 inches (18 centimeters) across that help them walk on mud and mats of plants without slipping. We tend to think of antelope as living in big groups, but not all species form large herds. Some antelope are famous for their massive herds, like the thousands of wildebeest making their annual migration across the African plains. Others, like duikers Cephalophus sp., bongos Tragelaphus euryceros, dik-diks Madoqua sp., and sitatungas, live alone, in pairs, or in small groups of between 3 and 10 animals. The social life of antelope depends a lot on the type of habitat they live in and how much food and water is available. Some antelope species, like impalas, springboks Antidorcas marsupialis, and saigas Saiga tatarica form very large herds during migratory seasons when they are on the move to find the best food. The males are not usually territorial at these times, but they may separate out during the breeding season and stake out a territory where they compete for females. They may also use size or strength displays or threaten with their horns to determine who's dominant and to keep females. Many antelope that live in large groups at least part of the year also have special scent glands on their hooves, so they leave the herd's scent on the ground for any stray members to find. In territorial species like sable antelope, oryx Oryx sp., waterbuck Kobus ellipsiprymnus, bontebok Damaliscus pygargus, and gazelles, the males choose a particular piece of habitat and defend it from other adult males. Herds of females and their young can come and go freely, although in the breeding season the male will try to keep them in his territory. Antelope are herbivores, with an odd exception: some species of duikers have been known to kill and eat insects, small mammals, and birds. Otherwise, antelope tend to be either browsers or grazers. Some species switch back and forth, eating whatever is most nutritious or what's available during dry or cold times of the year. Some antelope have special feeding adaptations for their environments. Addaxes Addax nasomaculatus know to follow the rains, traveling great distances to eat the new plant growth. Thomson's gazelles Gazella thomsonii follow herds of migrating wildebeest and zebras, which eat the tougher layer of grasses and leave the shorter, more tender shoots behind. Perhaps two of the oddest-looking antelope are the gerenuk Litocranius walleri and the dibatag Ammodorcas clarkei, both of which have slender bodies, long thin legs, and very long necks. They can stand upright on their hind legs and stretch up with those long necks to eat leaves that other species can't reach! Antelope calves have two survival strategies: either they hide out to avoid predators, or they start traveling right after birth so they can join the protection of the herd. The majority of antelope use the hiding approach, like elands, greater kudu Tragelaphus strepsiceros, roan antelope Hippotragus equinus, waterbucks, klipspringers, and duikers. In species that migrate or live in large ranges, like the hartebeest Alcelaphus buselaphus, topi Damaliscus lunatus, bontebok, and wildebeest, the calves are up and on their feet within a few minutes to a day or so after they are born, and they immediately start traveling with the herd. They often stick together as a group and are protected by adults surrounding them. This way they don't get left behind and can nurse from their mothers. If danger approaches, the adults can face the challenge with their strength and their horns.